Battle Management Systems (BMS) for land forces are increasingly migrating down to the lowest tactical echelons, thanks to reductions in the size of the computer technology required to host BMSs, placing such capabilities in the hands of dismounted troops. Discussing this spread of BMS technology across the battlefield, industry sources described to AMR how the dismounted close quarter battle and special forces communities globally were leading developments in BMS technology. 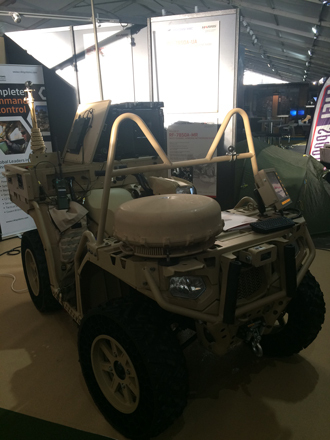 As an example, C4I Systems, a UK-based company is offering up its BMS capabilities onboard Polaris Government and Defence’s Ranger four-wheel drive all terrain vehicle. Unveiled at the Special Operations forces Innovation Network Seminar (SOFINS) at Camp Souge, France, on 28th March 2017, the solution illustrates the direction the market is heading with demand for BMS services down to the lowest tactical level, defence sources explained to AMR. 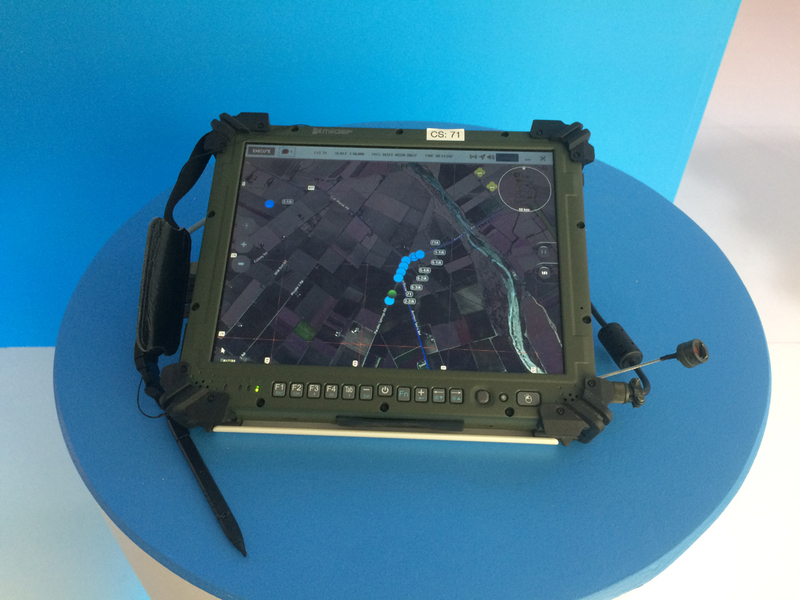 Elsewhere, company executives from Getac UK have launched the latest addition in their tactical handheld EUD (End User Device) rugged laptop and tablet family, designed for dismounted and special operations situational awareness and BMS applications. Speaking to AMR at the launch of the MX50 EUD on 7th March 2017 Chris Bye, president of Getac UK, described how the technology represented a “must have” capability for mobile computing challenges faced by dismounted soldiers: “There is a trend toward consumer grade mobile devices for use in the military because they’re lightweight and familiar. But these devices are not built to withstand harsh environments, or deliver the power, reliability and functionality today’s soldiers need,” he explained while referring to potential applications for the MX50 ranging from BMS and C2 through to more specialist roles such as joint fires control and support, and the dissemination of Intelligence, Surveillance, Reconnaissance (ISR) data: “With the MX50, we’re delivering the best of both worlds; a rugged device that meets real military needs, that is compact, lightweight and intuitive. Perfect for the already overburdened infantryman,” Mr. Bye added. Jackson White, Getac UK’s business development manager for defence and security customers, described how the MX50 was being procured by launch customers from across the NATO (North Atlantic Treaty Organisation) special forces community, providing assault teams and special reconnaissance teams with a dismounted and mobile BMS capability down to the lowest tactical level. Capable of supporting multiple types of Operating Systems (OSs) running BMS software, including Android and Windows, the MX50 also includes USB (Universal Serial Bus) and Bluetooth connectivity based on user feedback from infantry and special operations teams as well as the UK’s Defence Science and Technology Laboratory, and industry partners including SEA, which were consulted during the MX50’s design process. According to Mr. White, current trends are seeing the 5.7 inch (144.8mm) EUD carried in a chest mount and integrated into plate carriers or load carrying equipment, allowing soldiers and operators to quickly glance down of view BMS and SA (Situational Awareness) information. Defence sources associated with the NATO special forces community, informed AMR that such a capability represented a lower cost and interim solution to armed forces ahead of the more widespread proliferation of Augmented Reality (AR) software into head- and helmet-mounted night vision devices. Put simply, AR projects computer-generated images onto a user’s field-of-view: “The human-man interface is very important for Getac to allow for full functionality,” Mr. White explained while highlighting how the EUD features a two mega-pixel and eight mega-pixel camera on the front and rear of the device respectively for the dissemination of stills photography across BMS networks. Powered by an Intel mobile system-on-chip processor, the MX50 is capable of providing soldiers with: “high processing speeds and low power consumption so they can quickly view, manipulate and send/receive data, access battlefield applications, disseminate blue and red forces tracking, fire control orders and mission command information,” Mr. White continued: “The device has undergone rigorous testing and is certified to (the US Department of Defence’s) Military Standards 810G and 461G (covering environmental and electromagnetic interference characteristics respectively). Security is paramount for defence and stringent standards are required for devices to be accepted and used by personnel. The MX50 meets the Common Criteria ISO/IEC 15408 computer security requirements of the International Organisation for Standardisation which works closely with the United Nations Economic and Social Council, as well as US National Security Agency requirements, Mr. White continued. Additionally, the EUD weighs just 400 grams (0.9 pounds) as a response to ongoing calls from the user community to reduce the burden on dismounted personnel, Mr. White explained while describing how the device was being considered by both the US Army’s Nett Warrior soldier modernisation programme; the US Special Operations Command’s (USSOCOM) Tactical Local Area Network (TACLAN) imitative; and the UK Ministry of Defence’s Distributed Situation Awareness concept. All of these efforts require a BMS capability with capacity to process, exploit and disseminate ISR intelligence across secure voice and data channels via tactical radios. Highlighting the USSOCOM’s TACLAN programme as an example, Mr. White explained how the Tampa, Florida-based command was seeking a ruggedised EUD using the Android operating systems capable of being integrated with Harris tactical radios, such as the firm’s RF-335M Very High Frequency/Ultra High Frequency (30 megahertz/MHz to three gigahertz) handheld radios which are expected to commence deliveries to USSOCOM in September 2017, according to reports. The TACLAN concept is designed to provide the lowest tactical echelon in the special forces with a dismounted BMS capability including the capacity to conduct real-time and secure ‘battlefield chat’ as well as other specialities previously mentioned including Joint Terminal Attack Controller (JTACs) tasks: “The latest Android OS makes it easy for third party applications and soldier systems such as Battle Management Systems (BMS) to be loaded onto the device as required. The rugged nature of the device means it can withstand drops and other impacts, operate seamlessly in extreme weather conditions from -21 degrees to 60 degrees Celsius,” Mr. White concluded. BMS technology remains prevalent across the international community with significant programmes being undertaken in not only Europe and North America but also the Middle East and the Asia-Pacific. On 20th February 2017, the UAE Armed Forces contracted Harris in a $189 million deal to deliver an integrated BMS for its ground forces. According to Harris officials, the move is designed to further develop the “operational battlefield management capability” of the armed forces as combat elements begin to transition towards more “digital operations,” the company stated in a press release announcing the news. The UAE’s solution falls under the country’s overarching Emirates Command and Control System Land Tactical System programme, which is being executed to “…integrate, coordinate and maximise the combined efficiency of UAE armed forces assets,” a Harris spokesperson informed AMR: “Harris Battlefield Management Systems offer military customers a cutting-edge, continuous operations platform for situational awareness and staff functions. Through a combination of sophisticated technology and high-value systems integration services, military users can effectively track hostile and blue forces, develop and execute tactical operations and integrate personnel, intelligence, local weather, planning, and other data into battlefield operations,” the press release continued: “This Land Tactical System project represents a major milestone in the advancement of battlefield management and staff function capabilities for the UAE Armed Forces. It will help ensure that the UAE Land Forces brigades are equipped to succeed on the modern battlefield,” Ed Zoiss, the rresident for Harris electronic systems, articulated in the press release. According to AMR sources, an initial tranche of 800 UAE Armed Forces personnel will begin training on the BMS system later in 2017 as the technology is rolled out to provide information exchange between the lowest tactical echelons up to division command structures. The BMS will feature a series of technologies provided by sub-contractors include Leonardo’s DRS subsidiary, Saab and Systematic. These include DRS’ Data Distribution Unit which provides ground forces with the ability to integrate C2 and electronic warfare systems under the control of a single workstation, allowing for the dissemination of information across a battlefield network in near real-time. As DRS’ literature explains: “Using this workstation, users can monitor, control and interact with the entire system simultaneously.” The Data Distribution Unit is capable of being integrated into wider C2 networks to control a disparate radios and sensors, for example. Finally, Systematic has been tasked with equipping command and frontline force components with C2 technology, based around its SitaWare C2 software suite: This includes SitaWare Headquarters, Frontline, Friendly Force Tracking, Tactical Data Communication and Coalition Interoperability products, according to a company spokesperson, and they added that this software can be integrated onto any end user device connected to a tactical radio: “With so much information to be processed, it’s vital that operational headquarters staff have the most advanced command and control tools available to filter out irrelevant information and get a full appreciation of the battlespace,” SitaWare sources highlighted to AMR. Already in operational use with 15 nations. This allows for air, naval, land and special operations centres to be networked into a Joint Operations Centre from which command can be exercised, as well as forces from coalition partners, other government and non-government agencies. Elsewhere, industry continues to position itself for the Heer (German Army) Mobile Tactical Information Network (MoTIV) programme which, according to industry sources, comprises a BMS requirement for mounted and dismounted users on the battlefield. Companies vying for the programme include Systematic as well as Rheinmetall which is promoting its own TACNET BMS system. Speaking to AMR at the AFCEA (Armed Forces Communications and Electronics Association) exhibition in Bonn, western Germany in late April. Timo Burger, Rheinmetall sales director explained how TACNET was available in headquarters, mounted and dismounted versions although the company’s strategy for the MoTIV programme focused on the latter two variants. Additional options could include Kongsberg’s ComBatt C2 Information Product Suite which features a BMS capability for company, platoon and squad-level operations. According to company literature, the ComBatt BMS solution networks C2 technology to EUDs: “The ComBatt BMS software can be installed on computers where size, capacity and performance are based upon operational requirements and physical space. Because the physical space available in most vehicles is limited, the ComBatt BMS utilises a touch screen,” Kongsberg’s official literature states. The BMS relies upon low bandwidth communication channels to exchange information between ground vehicles and other BMS nodes, including the firm’s own remote weapons station products, company literature added: ‘This integration increases safety and optimises the use of sensors and effectors. The risk for blue-on-blue incidents is significantly reduced and warnings are issued if own units are within the sensor’s field of view … Every vehicle may send call for fire, enemy observations and receive weapon slew requests,” the literature concluded. One of the largest BMS programmes currently being undertaken globally is taking place in the region with an Indian Army concept already lagging behind schedule, industry sources suggested to AMR. Having signed contracts with Tata Power and BEL (Bharat Electronics Limited) consortia in February 2015 for the design and development of a BMS Technology Demonstrator for the army, progress remains slow with the second phase of the effort, designed to equip force elements with BMS capabilities, pushed back from 2017 to 2021, sources confirmed. Once fully integrated across the Indian Army’s communications networks, including infantry battlegroups, mechanised and armoured infantry units as well as special forces, the BMS technology will be further upgraded from 2026 onwards, according to AMR’s Indian Army sources. The BMS will be carried across the networks developed as a result of the Indian Army’s Tactical Communications System (TCS) which is replacing its legacy Army Radio Engineered Network (AREN). Sources explained to AMR how the BMS will integrate ground command centres into airborne Indian Air Force networks to allow the army to exploit in a three-dimensional fashion via the exploitation of airborne and satellite Imagery Intelligence (IMINT). To this end, both consortia are developing Static and Mobile Image Exploitation Systems for the interpretation of such data, expected to be operated by IMINT analysis teams in vehicle-mounted and headquarter installations, which will also be procured as part of the BMS roll-out. Meanwhile, the BMS programme continues to focus on Signals Intelligence (SIGINT) with India’s Defence Research and Development Organisation (DRDO) partnering with local company Samyukta concentrating on the development of an electronic warfare system covering 1.5 megahertz/MHz to 40 gigahertz (GHz) frequency bands, which will allow it to collect intelligence and jam high band tactical radios, satellite communications and military radars. Work includes the design of a stand-alone jammer which can also be networked into the wider BMS with the addition of other electronic countermeasures. The DRDO was unable to provide further details to AMR due to operational security concerns although industry sources confirmed to AMR that several candidate solutions remained under evaluation. 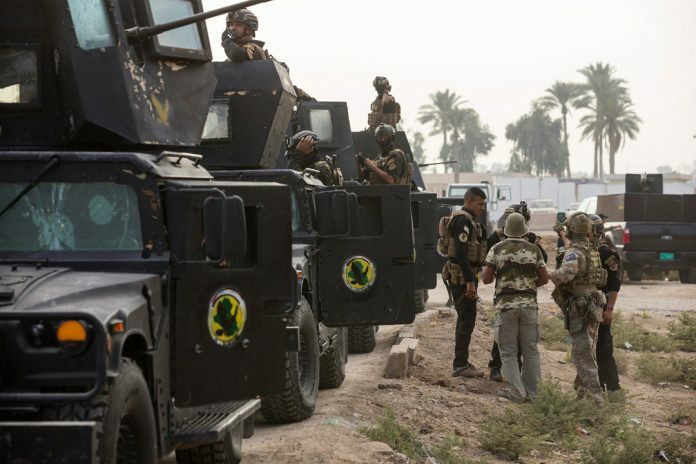 Such a capability is expected to provide the army with an ability to collect, process, exploit and disseminate electronic intelligence, as well as protecting vehicle-mounted, headquarters and dismounted units from electronic attack. Elsewhere in Asia Pacific, Hanwha Systems used the International Defence Exhibition (IDEX) in Abu Dhabi on in February 2017 to promote its latest solutions in the BMS sphere. Designed for the Republic of Korean Army, the firms’ Vista BMS software comprises a tactical C2 capability for battalion battlegroup forces and below, company sources explained to AMR. Technology, which completed operational evaluation in 2016, has been designed to be integrated on board a variety of man-portable and vehicle-mounted EUDs including the Vista-PL (Portable Laptop) and Vista-VM (Vehicle Mounted) respectively. The device is also available in a handheld (Vista-HH) configuration, company officials confirmed. The Vista package will provide mounted and dismounted troops with situational awareness, which more specifically comprises blue force tracking, battle management, ISR and other C2 applications. The Vista-VM model provides commanders with a common operating picture as well as target management, decision support; mission planning and management; messaging; digital mapping and position display; and after action review analysis industry sources explained to AMR. The Vista-PL variant has been designed to provide “optimal situation awareness to the user by displaying position of troops in real-time; provide C2 function by transmitting and receiving formatted messages and short text messages; and support various connectivity through tactical radio data ports , WiFi and USB,” the firm added. Finally, the Vista-HH has been designed to provide a BMS capability down to the lowest tactical level allowing dismounted troops to transmit and receive formatted and short text messages in a secure environment. This includes wifi-generated ‘combat bubbles’ for assault teams conducting Military Operations in Urban Terrain (MOUT) in particular, defence sources highlighted to AMR. Weighing just 550g (1.2lb), the Vista-HH EUD runs uses the Android or Windows OS and can be carried on a chest-mount or grab bag, sources concluded. Finally, industry sources described to AMR how the ROK Army is expected to begin fielding an undisclosed number of Vista family EUDs towards the end of 2017, including a helicopter-mounted system for airborne operations. The critical importance of BMS technology will mean that it continues to proliferate across the armed forces of the Asia-Pacific and beyond as greater requirements for tactical situation awareness and C2 is demanded at the lowest tactical levels. However, industry must deliver solutions which will not inhibit such operations which are by their very nature, dynamic, congested and contested.